Most people are genuinely appreciative of inheritances. But sometimes it may be too good to be true. While inherited property is typically tax-free to the recipient, this isn’t the case with an asset that’s considered income in respect of a decedent (IRD). If you inherit previously untaxed property, such as an IRA or other retirement account, the resulting IRD can produce significant income tax liability. IRD is income that the deceased was entitled to, but hadn’t yet received, at the time of his or her death. It’s included in the deceased’s estate for estate tax purposes, but not reported on his or her final income tax return, which includes only income received before death. To ensure that this income doesn’t escape taxation, the tax code provides for it to be taxed when it’s distributed to the deceased’s beneficiaries. Also, IRD retains the character it would have had in the deceased’s hands. For example, if the income would have been long-term capital gain to the deceased, it’s taxed as such to the beneficiary. 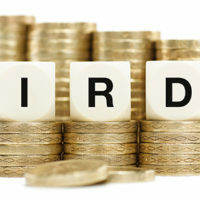 IRD can come from various sources, such as unpaid salary and distributions from traditional IRAs. In addition, IRD results from deferred compensation benefits and accrued but unpaid interest, dividends and rent. If you inherit IRD property, you may be able to minimize the tax impact by taking advantage of the IRD income tax deduction. This frequently overlooked write-off allows you to offset a portion of your IRD with any estate taxes paid by the deceased’s estate that was attributable to IRD assets. You can deduct this amount on Schedule A of your federal income tax return as a miscellaneous itemized deduction. But unlike many other deductions in that category, the IRD deduction isn’t subject to the 2%-of-adjusted-gross-income floor. Therefore, it hasn’t been suspended by the Tax Cuts and Jobs Act. Keep in mind that the IRD deduction reduces, but doesn’t eliminate, IRD. And if the value of the deceased’s estate isn’t subject to estate tax — because it falls within the estate tax exemption amount ($11.18 million for 2018), for example — there’s no deduction at all. Calculating the deduction can be complex, especially when there are multiple IRD assets and beneficiaries. Basically, the estate tax attributable to a particular asset is determined by calculating the difference between the tax actually paid by the deceased’s estate and the tax it would have paid had that asset’s net value been excluded. IRD property can result in an unpleasant tax surprise. We can help you identify IRD assets and determine their tax implications.